....for Spring to arrive! Yes, I am. Are you dreaming of gardening and flowers, fresh produce and Farmers Markets? I can't wait for all of that to arrive :) February is almost gone, and March will bring some serious cabin fever for me. The most severe part of winter will fade and I will just want all the snow to melt and to be able to play in the dirt. I spent an hour combing the internet for more information on how to prep my raised bed veggie gardens in the spring. I had built them 3 years ago and filled them with old cow pasture dirt. It was real dirt. Like the dirt in the garden on the farm where I grew up. Of coarse, my dad tilled it with composted cow and pig manure every year before we planted, and we mulched with grass clippings. That was a GARDEN. I bet it was half an acre. I know I had to weed a 50 foot row every day, as did my three siblings. By the time a week went by, it was time to start over, lol! I also want to change our 20 year old compost pile into something that will actually produce some compost I can use! I guess that means you have to actually do something besides toss all of your old kitchen and yard waste (minus meat and dairy) in a pile in your yard, huh. I did buy a new pitch fork 2 years ago! The old one's handle broke and it was cheaper to buy a new one... in the mean time, how about some stamped gardening? While I wait, I am playing with my big order that came Wednesday afternoon. I have not placed an order since December, during the pre-order for the Occasions Mini. I had been trying to combine as many of the new things as possible so I could have a good SAB order and take advantage of all the fabulous SAB free stuff! So now it was time to challenge myself. I had a couple of challenges in mind to try and here they are! Colour Q had this color challenge. I love the print on this box, but those are tough colors! I had to substitute Crisp Cantaloupe for the Apricot Appeal, and Calypso Coral for the Peach Parfait. 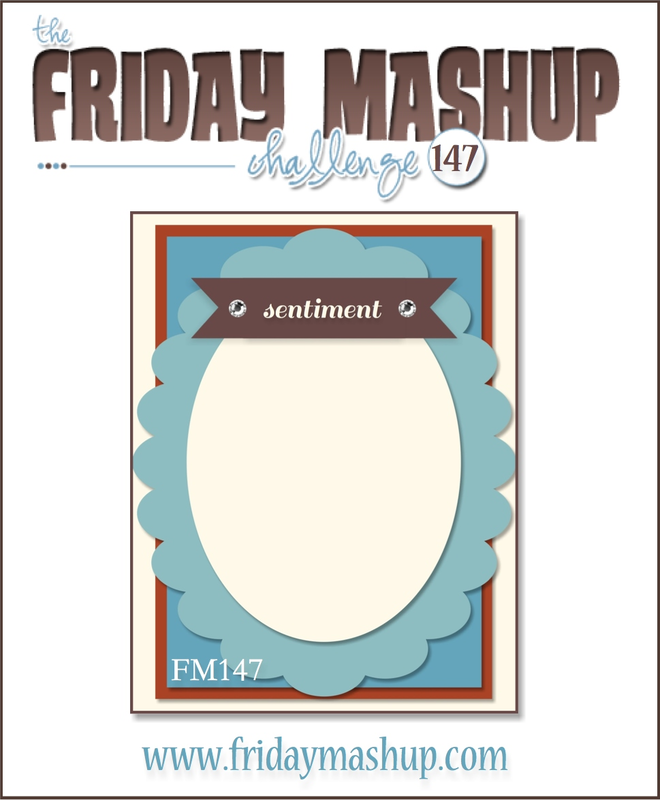 This sketch from the Friday Mashup was a great starter for this card! As I am typing this, I realized that I missed the deadline to add it to the Inlinkz gallery, oh well! I must admit, this card is really front heavy. I love the rose/posy image in this set sooo much! It is the image that made me buy this set. After I completed the card, I realized that I have no idea who I will send this card to with that sentiment! I know I was dreaming of lush flower beds while creating it, lol. I agree - it is quite a difficult combo of colours this week but you've totally pulled it off. The twine gives it a really lovely handmade feel...it's gorgeous. 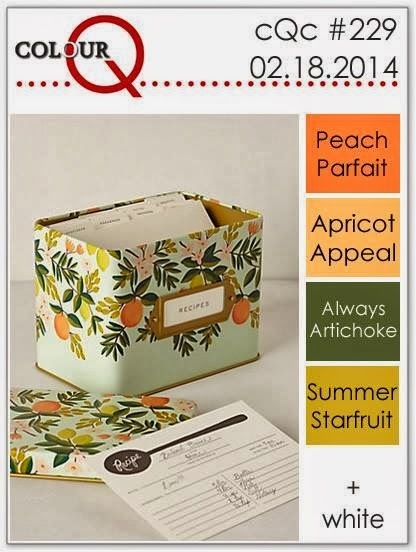 Thanks for playing along at Colour Q this week! Wonderful florals!! I agree I'm am ready for green grass and all things that bloom. Thanks so much for joining us at the ColourQ! 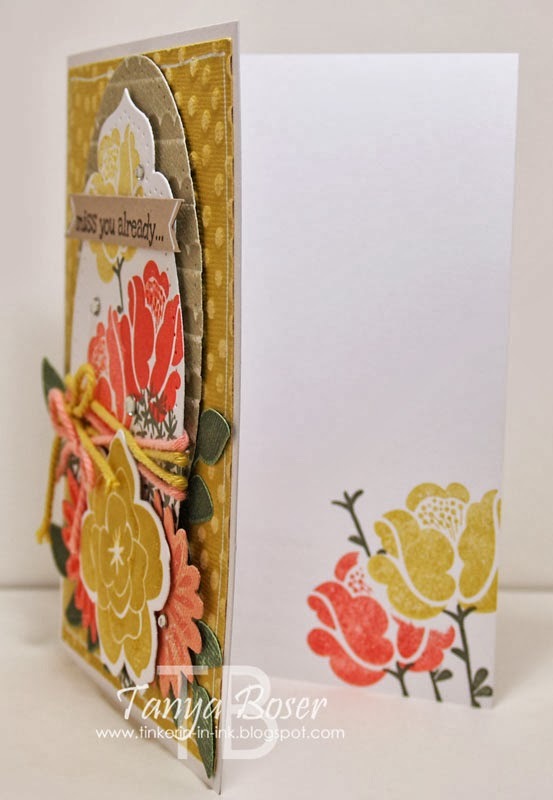 Another pretty card, Tanya! Thanks for sharing it with us at the colourQ this week. Gorgeous card! I love the flowers just bursting off it! Hope spring comes soon for you! WOW AWESOME card!!! You rocked this! !